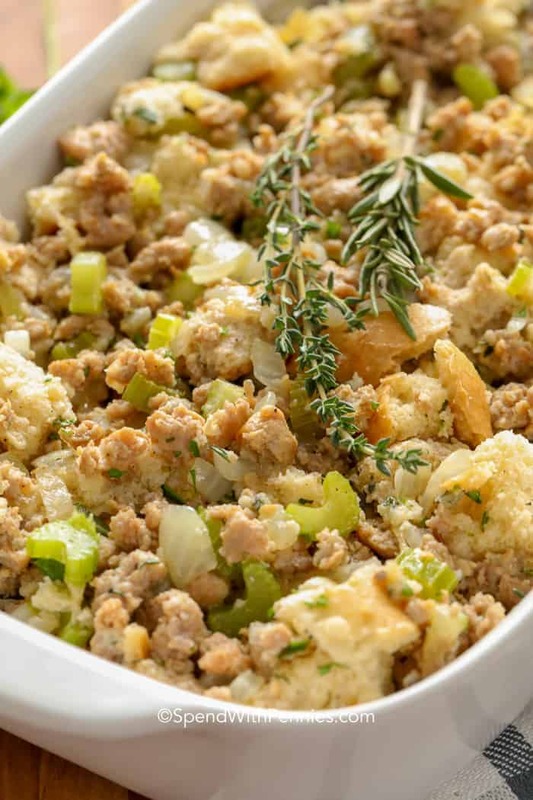 Sausage Stuffing is the perfect side dish for any holiday spread. 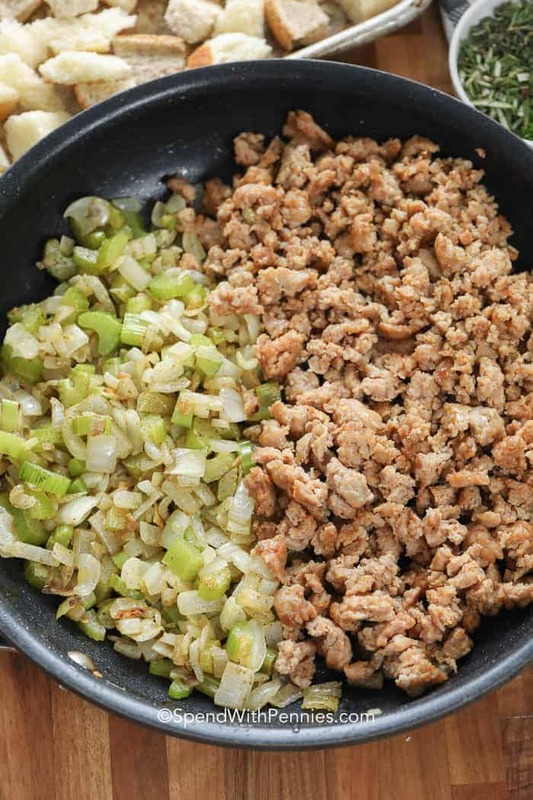 Celery, onions, fresh herbs, and seasoned pork sausage are tossed with bread and broth and baked until golden. This easy sausage stuffing recipe is full of flavor and perfect served with Turkey, Mashed Potatoes and Cranberry Sauce! Thanksgiving is always a big family holiday for us! 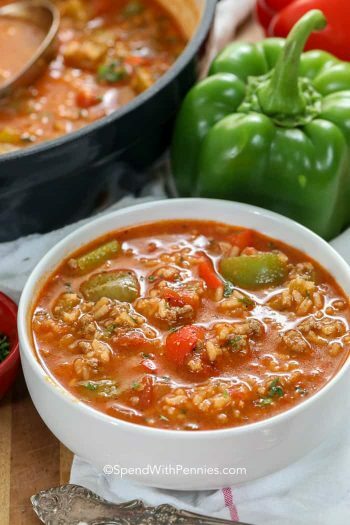 Since I often host a large crowd, I love dishes that I can prep ahead of time (and that everyone raves about)! 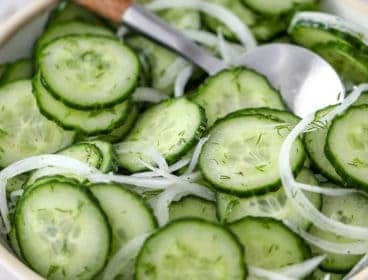 As much as I love turkey, I have to admit the thing I love most are the side dishes! From Sweet Potato Casserole to Classic Green Bean Casserole (and of course corn casserole) I could skip the turkey and just have a spread of sides. 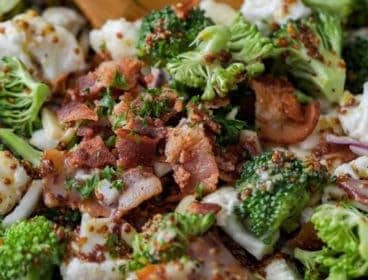 My absolute favorite side dish is always – stuffing! 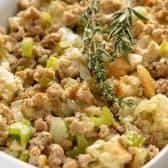 A traditional stuffing recipe has been my go to (and don’t get me wrong, I do love a classic dressing) but this sausage stuffing recipe is next level. Between the juicy chunks of seasoned sausage and fresh herbs this is definitely my new holiday must have! The juices from the sausage add great flavor to the dressing and of course fresh herbs make everything better! 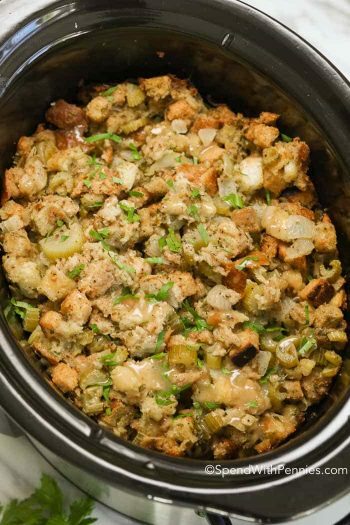 Thanksgiving dressing (or stuffing) with sausage is delicious and flavorful! 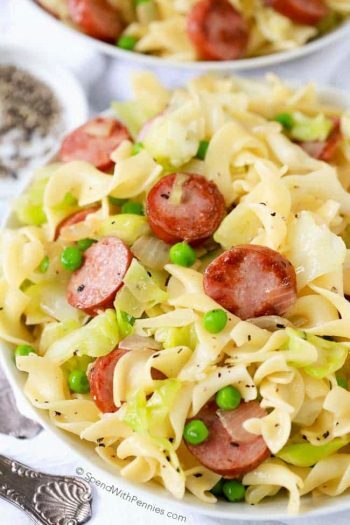 Made with fried sausage, celery, onion, seasoned with poultry seasoning and fresh herbs. Tear/slice bread cubes and allow to dry overnight. Brown sausage and set aside. Cook celery and onions. 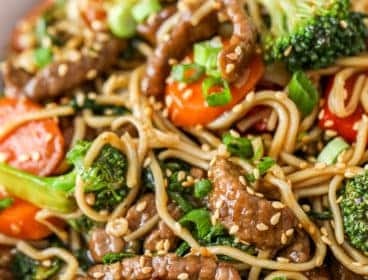 Toss all ingredients with broth until moist. Bake (or cool completely and stuff your turkey). To save time (and space) on the big day, I like to prep my stuffing up to 24 hours in advance and storing it in the fridge. Then, I can just pop it in the oven when it’s time (you may need to add a few extra minutes bake time if it’s chilled from the fridge)! 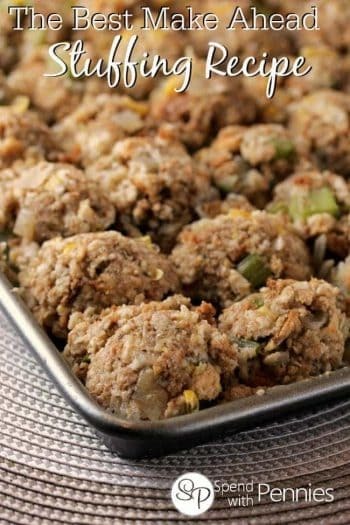 I love to cook sausage stuffing a casserole dish in the oven but of course it’s fabulous stuffed inside of a turkey too! 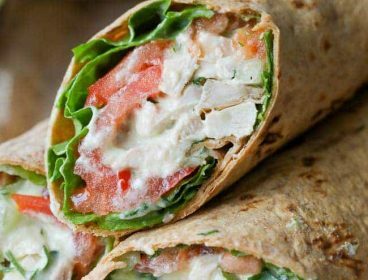 You’ll need approximately 1/2 cup of stuffing per pound of turkey. 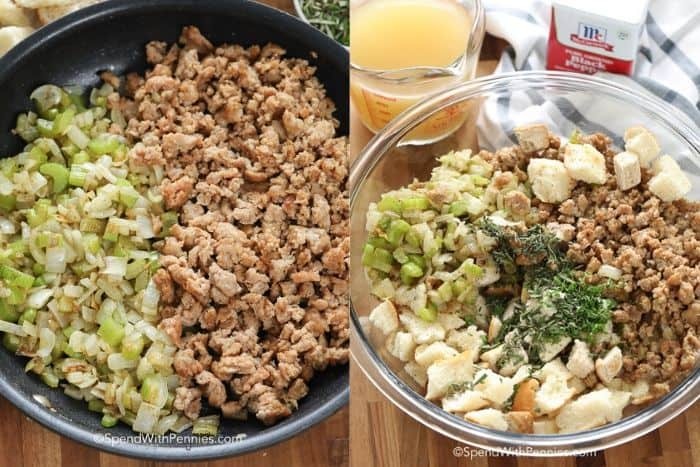 Stuffing is easy to make but the consistency and flavor can vary based on your ingredients and even the type of bread you choose! Any kind of bread will work. 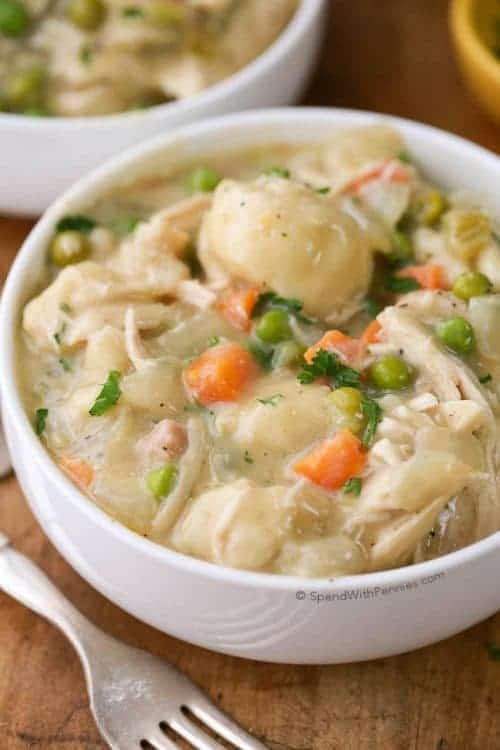 The amount of broth needed for stuffing can vary greatly based on the type of bread you use and how dry it is. Eg. dried bread cubes from the store will require much more broth than cubes left on the counter overnight. Sausage and any add-ins (see below) will also add moisture so ensure your stuffing isn’t soggy. Homemade Creamed Corn – The best ever! Bacon Green Bean Bundles – Favorite! Classic Deviled Eggs Recipe – Make ahead! 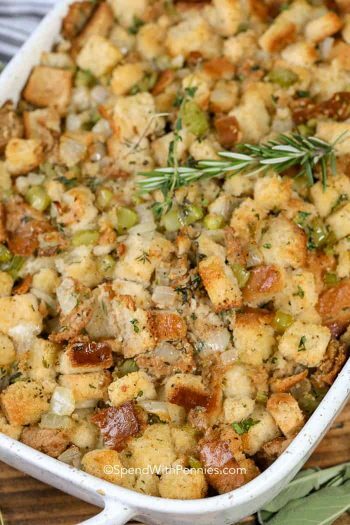 This sausage stuffing recipe is the perfect side dish for any holiday spread. Brown sausage until no pink remains. 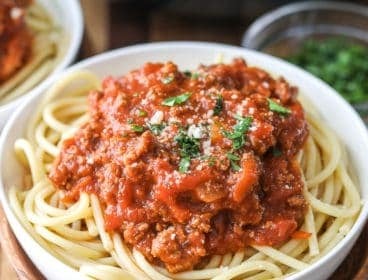 Remove from skillet reserving drippings. 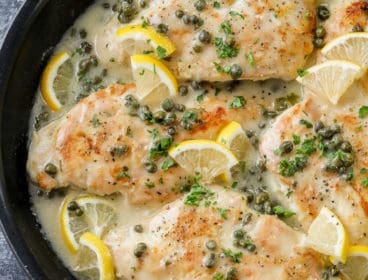 Add 1 tablespoon butter to the skillet. Add onion, celery and poultry seasoning and cook over medium heat until softened, about 5 minutes. 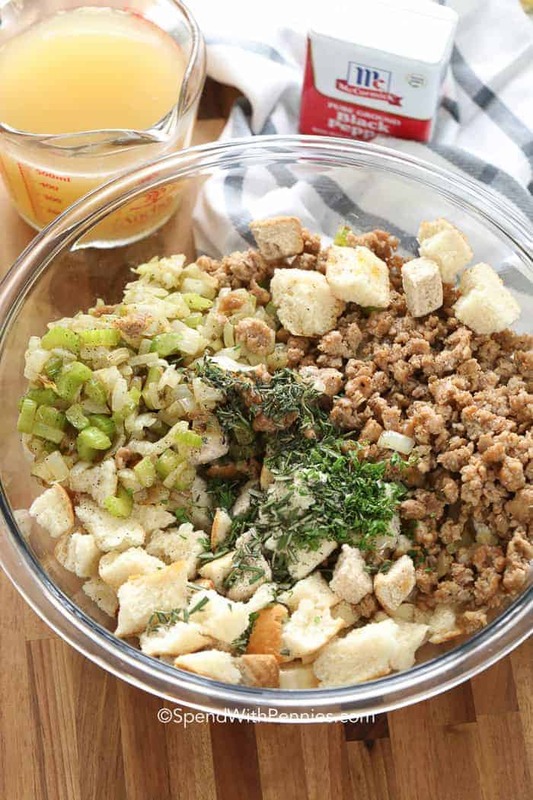 In a large mixing bowl, add dried bread cubes, cooled sausage, onions and celery, fresh herbs. Toss to combine. Add broth a little bit at a time while stirring to combine *see note. Season to taste with salt and pepper. 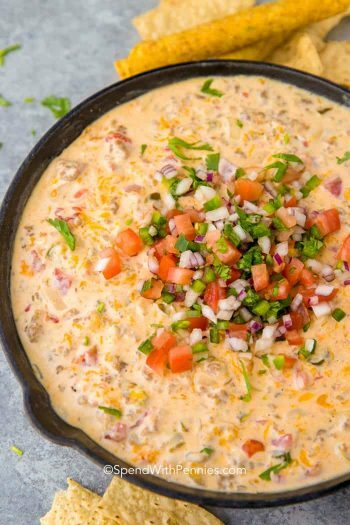 Place in a 2.5qt casserole dish and drizzle with 1/4 cup melted butter. The amount of broth will vary based on type of bread used. Add broth to soften the bread (you don't want it mushy). Allow a bit of time for bread to soak up broth between additions if your bread is very dry.